Japan's Space Agency to Sell Space-Suit Tech "Cooling Vests"
Need help fighting the summer heat? 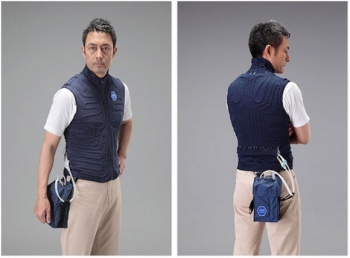 Pick up one of JAXA's "cooling vests" for just $590. JAXA, Japan's Space Agency, has just announced the sale of a new "cooling vest" that uses space-suit technology to keep the wearer cool. The vests are composed of a network of tubing and a pump unit which circulates the coolant around the vest at a temperature of four degrees Celsius (39.2 degrees Fahrenheit). One liter (33.8 oz) of water can cool the vest for approximately 30 minutes. There's one way to beat the summer heat. The vests can also absorb and evaporate sweat immediately. To top it off, they are 100% polyester and completely machine-washable. The cooling tech is the same stuff inside of JAXA astronaut's space-suits, to regulate their temperatures inside the air-tight suits. Of course, this kind of space-age cooling wont come cheap, as each vest has a RRP of 60,000 yen (US$590), and there will be a very limited run of just 1,000 vests to be produced in 2014. The vest's availability to regular non-astronaut types was born from a collaboration between JAXA and Teikoku Sen-I Co., Ltd., originally a manufacturer of linen and now of disaster-prevention products. They will be released under JAXA's own brand JAXA COSMODE, which affirms itself to be "a brand designed to introduce the features of space to our lives on the ground." While its still pretty expensive and exclusive right now, here's hoping that in a few years everyone will be able to afford one of these babies, and sweating like a pig in the summer humidity will become a thing of the past.